You see, I have a four-year-old son, and when we travel together as a family, my husband and I like to walk holding his hands on both sides – I usually hold him with my right hand so that I could have more control over where he goes. We usually do a lot of walking the first couple of days of any vacation, and my son has a habit of lifting both feet off the ground as we walk. He usually does it suddenly, so the entire right side of my torso has to contract immediately to support his weight (40 pounds) and my right hip takes on a huge extra load (while moving). As a result the muscles on the right side of my body go into spasm, they pull my sacrum out of alignment and the entire right side of the body goes bonkers. Very often some really simple behaviors can cause a lot of trouble. Some of them create the imbalances in the body if repeated many, many times, while others serve as the proverbial “last straw that broke the camel’s back,” compromising the body in the most vulnerable area. That is why the very first thing we should do if we start having any kind of chronic pain is to analyze our behavior. What might be causing this? It is important to identify the behavior so that you can stop it or modify it. In my situation, once I discovered the culprit of my “vacation hip problem” I could stop it by simply not holding my son’s hand if my husband was holding his other hand – that way he had no opportunity to play monkey. Sometimes it is not possible to stop the behavior – for example, if you are a writer, you cannot stop using the computer, but there are always steps that you can take to modify your body positioning, shorten the stretches of time that you engage in the behavior continuously, and do other things (like yoga, exercise, etc.) to balance it out. However, it is not always easy to pinpoint the issue and it might take some time to investigate the problem. A few years back one of my teacher-trainees started having a wrist issue that was becoming really problematic. She stopped doing Chaturangas, limited her computer use and made many other small changes, but the problem persisted. Then one day as she was opening the front door of her office it dawned on her that the door handle was really tight and it took her considerable effort to turn the door knob to open it, which twisted her wrist and caused pain. She has been doing this action for many years several times a day and never gave it a second thought. Does it mean that the tight door knob caused her wrist issue? Not necessarily. But since her wrist was weakened by other things, it didn’t take much to throw it off balance. After swapping the old door knob for a new, more smooth-working one (and maintaining all the small changes that she had put in place), she was able to get rid of her wrist pain completely. I like to think of it this way. Your body doesn’t like to be in pain; it is constantly striving toward the state of homeostasis. The pain is a signal that it cannot get there. Very often the habitual behaviors that we engage in stop the healing process and prevent the body from returning to the state of balance. Our job is to identify those obstacles and remove them, and then try to facilitate the healing process. Ultimately it doesn’t matter how much work you do on the body in your yoga practice or elsewhere – if you don’t change the offending behavior, you will keep having problems. Identifying the behavior is also very useful in figuring out which areas to target in your work. 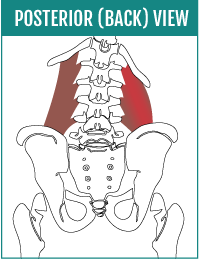 For example, my “vacation pain” was moving from place to place – sacrum, hip flexors, lower back. Once I identified the problem it became clear that all the secondary pains were caused by a spasm in the qudratus lumborum muscle on the right side (from sudden shortening every time my son would hang on my hand). That shortening had created an imbalance in the position of the pelvis and the shoulder girdle, which caused those “wondering” pains. It is always useful to identify the source of the problem so that you know what areas to target. Relieving tension in the quadratus lumborum muscle helped me restore balance in the body and get rid of the secondary pains. It is not always so straightforward though. Often several different things get tangled together and go on for so long that it becomes very hard to untangle them. One of my former clients had had an immobilizing cast on her leg when she was sixteen years old and developed a habit of dragging that leg around in a half-circle. This pattern was never addressed, it continued to a smaller degree after the cast was off and then resurfaced some 40 years later in the form of severe hip stiffness and imbalance. Of course, working with a movement pattern that’s been around for 40 years is much harder and takes much more effort. It is truly amazing how many physical aches and pains can be helped by troubleshooting habitual movement patterns. As yoga teachers we get to play detective and try to figure out what is causing or contributing to the problem. It also encourages our students to become aware of how they use their bodies on a daily basis. A thorough investigation of the student’s habitual movement patterns needs to be an essential part of any therapeutic yoga work. What kind of trouble-making movement patterns did you come across? Hi Kali – what a beautifully written post! This is exactly what I am talking about – one pattern leads to another then morphs into another … until it takes you five minutes to fill an oil diffuser 🙂 I am so happy to hear that you are choosing “to use this raised awareness to help my body make different–more balanced–choices.” In my opinion, this is what makes all the difference. I am looking forward to reading your other posts; how come there isn’t a place to “Like” your post? Cheers! Thanks! I notice that with my clients it’s also very important to raise their awareness of their own habits. Doing a therapeutic yoga practice daily is great, and slowing unraveling the patterns that caused injury, imbalance, or chronic pain is also critical to healing. I find it interesting that your discovery of your hip issue didn’t lead you to look at what you are doing to your sons shoulder/joint. I find it fascinating when in the airport people that have their children in a harness allowing them to walk “normal” with arms swinging get dirty looks. However, the parents that are almost pulling their children’s arms out of the sockets as they hold their hands to walk don’t get a second look. Looking at the top picture of the family walking the poor kid’s posture is askew because he can’t develop a natural shoulder/pelvis pattern when walking. One parent taller also adds another dimension to the equation. Just my thoughts……. a bit off the subject. Hi Nancy! I also am concerned when I see a parent lifting a child by one arm – that seems like too much for a little shoulder. But when parents walk holding the kid’s hands it doesn’t create any pull on the child’s shoulders ( unless the child decides to hang down). It is an equivalent for the child of keeping his arms raised, and most of the time his elbows are bent, which means that the shoulder is not loaded at all. As far as the image above it looks to me like the child is just wiggling around while walking (as they always do). 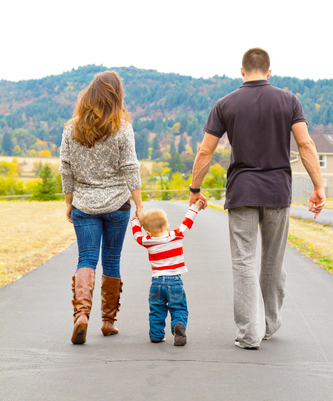 Even if the parents lift the child by both hands while walking, it seems to be an equivalent of the monkey bars or any other playground equipment that kids love. I would even make an argument that it might be good for kids to hang off things by the arms occasionally since this develops shoulder strength and maintains range of motion. 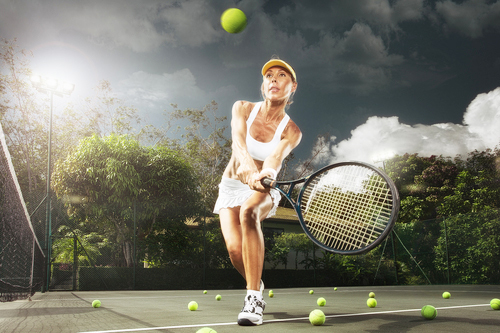 In fact, many shoulder problems for adults arise from the fact that we don’t bring the arms through the full range of motion much, especially in the overhead position. So personally I do not see anything wrong with holding your kid’s hands while walking. Thank you Carole! I hope you get this knot untangled soon! My deepest gratitude for the work that you have put into this website. It’s such a gift. They way you look at yoga resonates so much with the way I was taught and what I truly believe. I would like to know if you have ever written about a rounded back, kyphosis and some practices to accomodate and improve posture. I do make adjustments for it in the practice, but I wondered if you have seen significant changes to the posture through yoga. Thank you Sara! I have definitely seen progress through yoga when it comes to posture, but it’s usually very slow and gradual. When it comes to kyphosis usually the most important thing is to awaken the upper/middle back area, especially in back bends. I actually find that it’s best to work with it in the simplest of postures (like the magic three) because then one can focus better on specific details like widening the collar bones, pulling the shoulder blades down and distributing the curve evenly throughout the spine. The trick is to make it a habit to approach all other poses from the prospective of lengthening the spine first and then lifting the chest away from the navel. So to me it isn’t about the choice of poses so much but carrying those elements throughout the practice. Hope this helps!